TCP's LED BR lamps looks just like an incandescent, but are more energy efficient. The dimmable BR30 LED from TCP Lighting consumes only 12 watts of power, yet delivering a brilliant light that is the equivalent of a 85 watt incandescent. It has a light output of 850 lumens and color temperature of 2400K for a very warm white glow. This bulb has a long average lifetime rating of 25,000 hours. 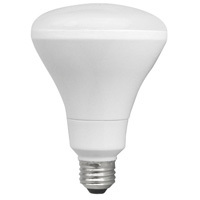 With a standard screw in base and BR30 shape, this LED makes replacing an incandescent simple.